QE4 was the fourth round of quantitative easing established by the Federal Reserve. The program began in January 2013. Through QE4, the Fed bought long-term U.S. Treasury notes using credit it created. It used its Trading Desk at the New York Federal Reserve Bank, buying $85 billion in Treasurys from member banks each month. Almost all banks are members of the Federal Reserve System. On June 19, 2013, the Federal Open Market Committee announced it would taper purchases by the end of the year. That's if economic growth, inflation, and unemployment were on track to meet the Fed's targets. Information on FOMC’s actions is laid out in the FOMC meetings summary which provides a top-level analysis of the U.S. economy. Investors panicked, leading the "taper tantrum." The stock market tumbled, and the yield on the 10-year Treasury note rose by 1 percent. The Fed delayed its tapering until December 2013. It reduced purchases by $10 billion a month through at least February 2014. 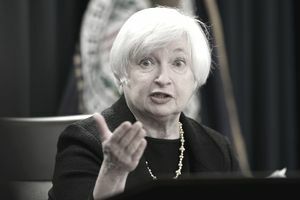 Newly-appointed Fed Chair Janet Yellen announced she expected the tapering to continue as planned. Unemployment dropped below 6.5 percent. The core inflation rate rose above 2.5 percent. That meant the Fed had two goals. It wanted to stimulate growth as well as prevent inflation. Until then, the Fed had prioritized inflation fighting more than job creation. By announcing specific targets, the Fed guaranteed that easing would continue through 2013. That's because unemployment was 7.7 percent, and inflation below 2 percent when the program was announced. This gave Congress and the president time to negotiate a solution to the fiscal cliff. Second, Bernanke announced the fed funds rate would stay at zero percent until 2015. Why did the Fed take such unusual actions? Bernanke believed that managing expectations was as powerful as the Fed's actions themselves. That's because uncertainty is so devastating to businesses' abilities to plan for the future. By announcing what he was going to do, and then doing it, Bernanke set a stable stage for economic growth. The first Fed Chairman to prove this was Paul Volcker. He tamed inflation by ceasing the stop-go monetary policy that had created it. Once businesses knew he would keep interest rates high, they stopped raising prices. That ended inflation. Bernanke was unlike his predecessor, former Fed Chairman Alan Greenspan. He was very mysterious about his intentions. Bernanke also had to offset the uncertainty generated by political leaders. They were in a deadlock over how to resolve the 2011 debt ceiling crisis and the 2012 fiscal cliff crisis. The fourth round of quantitative easing had three benefits. First, QE4 expanded the money supply like previous quantitative easing programs. By selling their Treasurys to the Fed, banks had more money to lend. They competed with each other by charging lower interest rates. Cheaper loans allowed more people to borrow to buy autos, furniture, and even school loans. Companies hired more workers to keep up with this added demand. That further boosted income and created even more demand. A second, related benefit was that the lower Treasury yields made mortgage rates lower. That boosted the housing market. A third advantage was that QE4 kept the value of the dollar lower. That's because it's like printing money. The more dollar-denominated credit that's available, the lower the value of the dollar. A lower dollar value boosted U.S. stocks because they were less expensive for foreign investors. As a result, the stock market rose 30 percent in 2013. The lower dollar value provided the fourth advantage from QE4. That was higher exports. American-made goods and services became cheaper to foreigners who then bought more. That higher demand also created U.S. jobs. Unfortunately, QE4 ended the Fed's Operation Twist program that had run with great success since September 2011. The Fed used the money it received when short-term Treasury bills came due to buy long-term Treasury notes. As a result, the rates on short-term bills rose, while the rates on long-term notes fell. The Fed ended Operation Twist because it had sold all the short-term Treasurys it owned. A second disadvantage was the potential to spark inflation. The Fed could have created too much money in the economy. This is one of the major causes of inflation. But inflation never happened. That's because the Fed would have no problem selling its Treasurys. It just transfers them to its member banks, cutting back on excess reserves. Second, the Fed wouldn't sell its bonds until the economy was on solid footing. Banks would want to transfer excess reserves to the Fed because they profit from higher interest rates. Third, Treasurys are risk-free investments. They are always in demand by governments, pensions, and others who value safety. On June 14, 2017, the Fed said it would reduce its holdings so gradually it wouldn't need to sell them. The Fed would allow $6 billion of Treasurys to mature without replacing them. Each month it would allow another $6 billion to mature. Its goal is to retire $30 billion a month. The Fed will do the same with its holdings of mortgage-backed securities. It would allow $4 billion to mature a month until it reaches $20 billion. On September 21, the Fed announced it would begin reducing its holdings in October 2017.